A colleague recommended this Russian restaurant claiming amazing food and impeccable service. 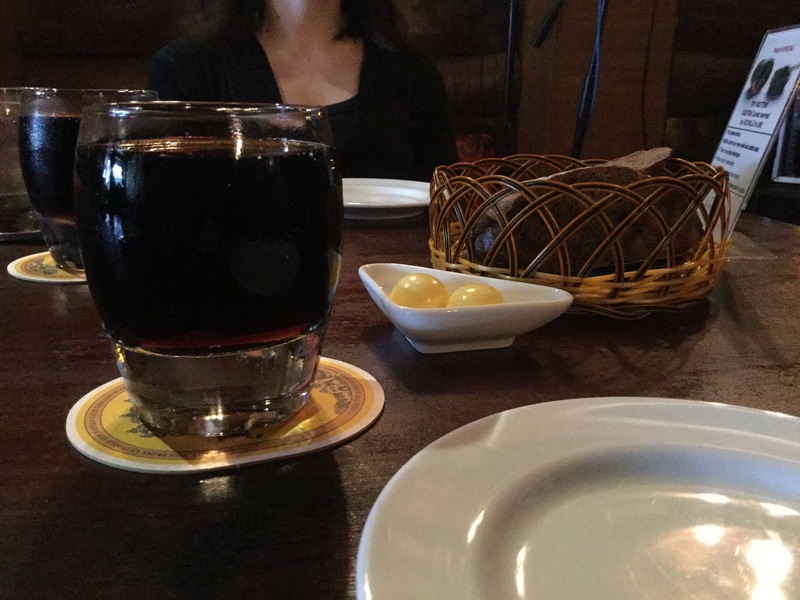 We wanted to test out his claim so we trudged through the rain to bring you to Buyan, a Russian restaurant in the lovely area of Duxton Road. It was raining. Pouring would be a better word. Angela and I were scuffling through the shophouses on Duxton Road with our umbrellas all opened up, ready to make a dash across the road to get to the Russian restaurant (Trust us, we had grandma toes before entering the restaurant). The waiter politely ushered us to our seats (in slightly accented English). There was a huge standee fan that was blowing at me and the same waiter hurried over to turn the fan to another direction. The interior was all woody and warm, the fan making soft whirring sounds as clinking of forks and spoons echoed in the restaurant. There wasn’t much of a crowd because of the wet weather but we heard that the evening crowd was so crazy that people had to reserve tables to get in. They also have live bands on every Monday, Thursday, Friday and Saturday so for all the music lovers please take note. We decided on their set lunches and added on 2 desserts to satisfy our sweet tooth. The menu changes from week to week so just check out their website here, to see what combinations they offer. Angela ordered the Datchny Salad and Pan-fried Salmon while I ordered the Solyanka and Pozharskiye Kotlety. The Set Meals ($15) came with a drink and since they were out of Mors that day, both of us ordered the Kwass. 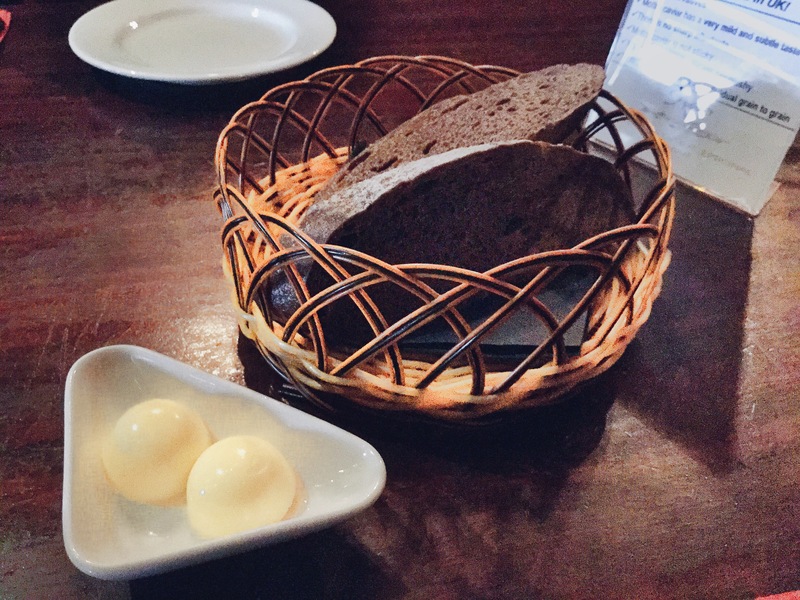 We were served dark bread and some butter to keep our hungry souls content before the appetizers arrived. My Solyanka came piping hot in a little ceramic bowl. The dish was the perfect thing to have on a cold rainy day. 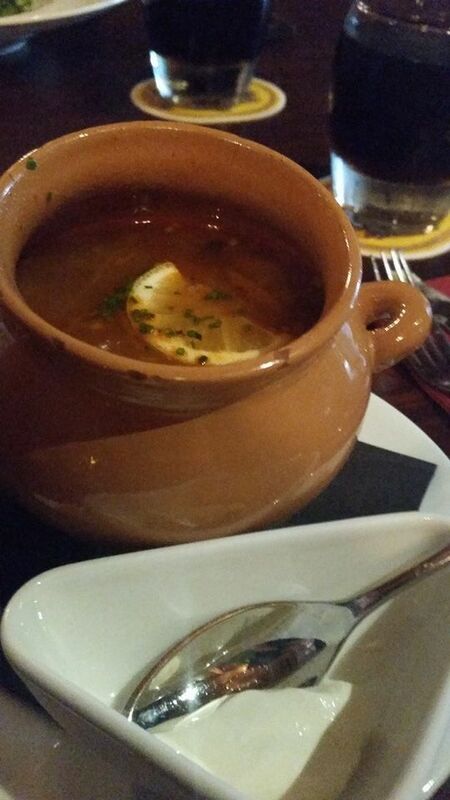 The soup was savoury and tender pieces of meat were buried in the soup like treasure. It also came with sour cream to mix into the soup. Give me some rice and I would be the happiest girl in the world right now! 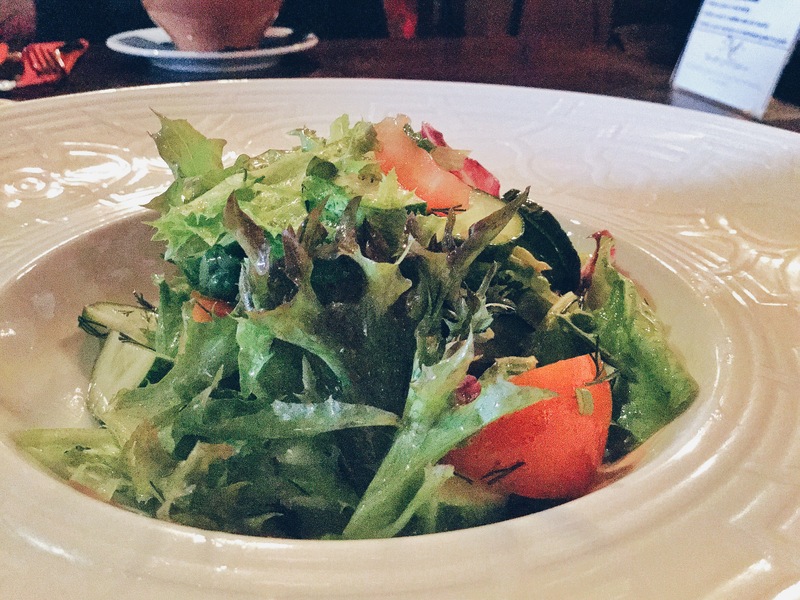 The Datchny Salad was fresh, the vegetables were crisp and the whole salad itself fused together in a mixture of sweet, sour and fresh earthy taste. I think the key to a good salad is how fresh the vegetables are and whether they have that crunch when you bite into it. This place definitely has that! After clearing our appetizers, the waiter immediately brought out our mains. That is what I called good service! 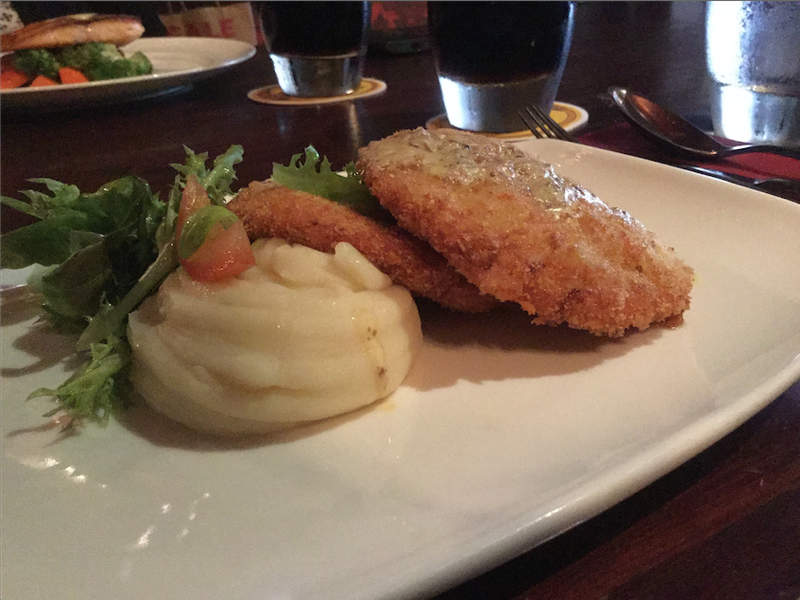 The Pozharskiye Kotlety is essentially, chicken patties baked with breadcrumbs and served with mashed potatoes. The chicken patties tasted… different, I’m not very sure whether I liked it or not but I was definitely not used to the taste. It tasted mildly sharp with an herb-infused taste. On the other hand, I loved the mashed potatoes! It was creamy and chunky at the same time, you could taste the potatoes yet it did not mask the taste of the milk added into the mash. Best part? It doesn’t give you the gelat feel after you eat it. The highlight of the Pan-Fried Salmon was the dill sauce drizzled on top of the slightly charred and crispy skin. 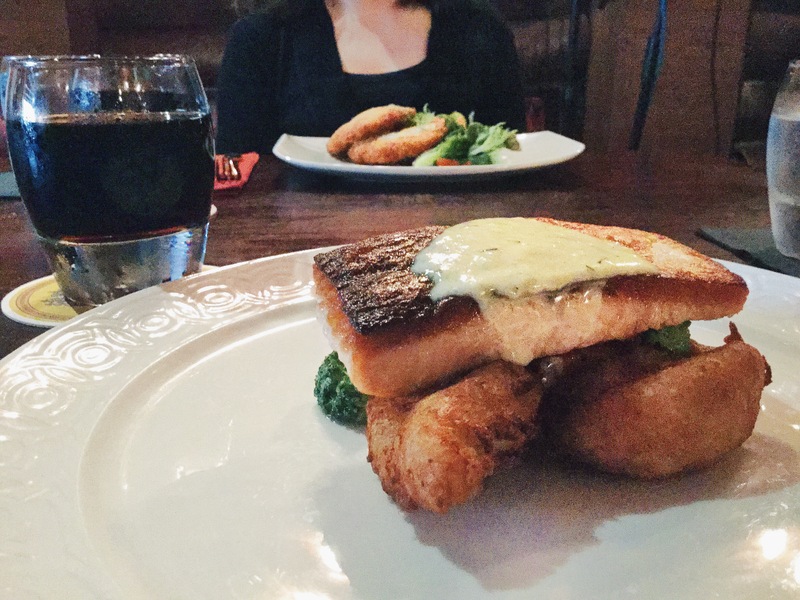 The dill sauce had a unique burst of flavours coupled with the salmon. Mmmm… and the salmon skin was not too charred but just had the right amount of crisp and firmness. The vegetable sides are a must to try. 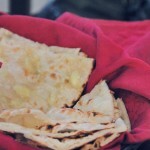 They were fresh and were boiled, buttered up to exude a fragrant aroma and they melt in your mouth. For the Kwass, Angela and I were joking about how it tasted like alcohol but it wasn’t alcoholic. It was only when we researched on the drink that we found out that it contains 1% alcohol. It was rather refreshing nonetheless. Kwass is actually fermented dark or rye bread which also gives colour to the drink. As for the dessert, we ordered the Medovik($10) and Bird’s Milk($12). 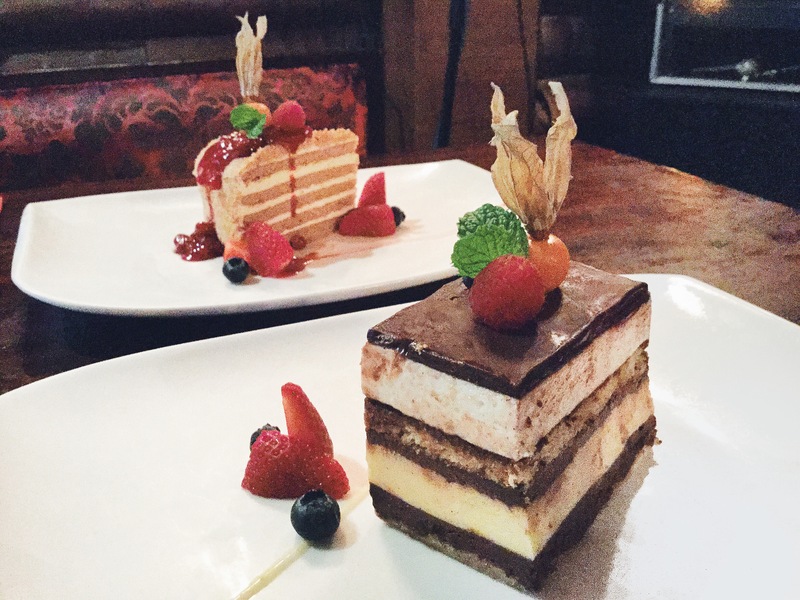 The Medovik was a layered shortbread honey cake that really surprised us. It doesn’t look like much in comparison to the Bird’s Milk. In the end, we finished the Medovik long before we finished the Bird’s Milk (it was a sweet concoction of light sponge cake, vanilla jelly, marshmallow and covered with chocolate glaze). The Bird’s Milk would suit people who are extreme sweet tooths and the Medovik would be for those who just want a light snack after a heavy meal. A warm and cosy place to pamper your tastebuds. Sit inside and enjoy the cosy setting. There is something so liberating in hearing the fans whirring, the clinking of plates, and the soft sounds of instrumental music playing in the air. Buyan is located at Duxton Hill. Alight at Tanjong Pagar and take a 15-20 minute walk to reach the restaurant. When you see a row of shophouses on a hill, you are at the right place. If all else fails, Google Maps is the way to go!